The Online, Monthly Teddy Bear Magazine Presents . . .
Armella Dana of Bears 'n Buds by Armella is a Midwest replant. Though she was born and raised in Neenah, Wisconsin, after attending college in music and arts, she married. After her husband finished his degree, they began their "real" life together, moving to Anaheim, California and starting a family. When Armella decided to become a full-time mother, she found that she needed to continue to dabble in her art. She spent her time doing pen and ink renderings, etchings, watercolors, soft sculpture and porcelain dolls. A new "artist bear collecting" pastor came to her church, she convinced Armella that creating soft and cuddly teddy bears would be preferable to making hard, cold porcelain dolls. She and her pastor attended a local doll and teddy show where her pastor "forced" her to buy a teddy bear kit to make. "The entire time I was working on the kit, I kept thinking, 'if I had designed this bear, I would have...' "
Armella's pastor took her to a teddy bear convention in Orange, California, and Armella was hooked. "Table after table of marvelous, exquisitely created artist bears with funny, affectionate, enthusiastic bear artists and collectors filled the rooms. From that time to this, I have never created another doll, painting, or etching or have gone back to any of my old outlets for my artistry. The teddy bear and I have kept this love affair strong for almost 20 years." Currently living in Marion, Iowa, she works diligently creating her bears which were all very sweet and huggable. 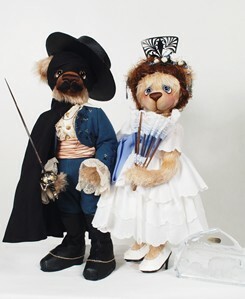 In the early years of creating dolls she now missed the elaborate costuming she used to make but now many of her bears have started wearing progressively more and more unique clothing. "Over the years I have created many characters of history, story books and from my imagination." "It is important to me to constantly change the style and size of the bear or bud I'm creating. I have made bears as small as three inches tall to my largest, which was a piece called "Beary Manilow," who wears toddler's sized clothes. She created it as an auction piece for a TBAI Conference in Binghampton, NY. Her bears are made with almost exclusively felt-padded noses with Perle floss wrap. "Though I do my noses in a wide variety of shapes, I have often been told by customers that they can recognize one of my noses from across the room." She also likes to vary the paws of her critters and prefers to do air-brush on her bears to give them a depth and dimension that removes, what she feels, can be the very flat look of unpainted bears. Armella enjoys making a collection of bears because, although all the bears in the collection may have a very similar appearance, their accessories, clothing and hair color/style will be different for each bear. Her creations have gleaned many awards and recognition; so many of her bears are on display in three Teddy Bear Museums around the country. In her spare time, Armella teaches teddy bear making workshops where she estimates that she has taught hundreds of people, collectors and artists, the many tricks and techniques she's learned from other artists and from her own experimentation. 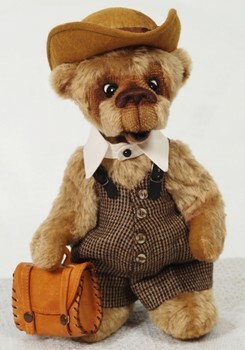 "The joy of the teddy bear world is not just the bear, but the people who make, love and adopt them. Those who share the enchantment of teddy bears are very special, loving and caring people." 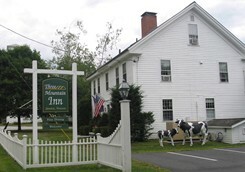 Collectors can adopt bears from her web site and right off the beds from three Bed and Breakfasts in Vermont and Iowa. As much as she enjoys "birthing" her bears and buds, the greatest joy in her life is spending time with her family. Her two children have given her three grandchildren which she adores spending time with and who knows, maybe one (or more) is a future "Bear and Bud" award winning artist in the making.